1. Muladhara: The Root Chakra –associated with red-Hindu God –Lord Ganesh and Brahman. 6. Ajna: The Third Eye Chakra – located at front of the head in between eye brows. indigo. A New Age symbol of enlightenment. A psychic ability connected to the occult. This is why Hindu’s wear the Tilak, the red spot between the eye brows. Hindu god Lord Shiva and Parvati, In Egypt it is known as The Eye of Horus or Osiris, In Freemasonry it is the All Seeing Eye, the symbol found on our dollar bill! This is also where the Pineal Gland is located. The goal of this complex ancient satanic doctrine is to open sensitive critical areas of the body for free entrance to a vast multitude of demons. The tragedy is, they are consciously, and willingly opening themselves through visualization, meditation, yoga, crystals, sounds like drumming, doing mantras, and vibrations, to these demonic forces. 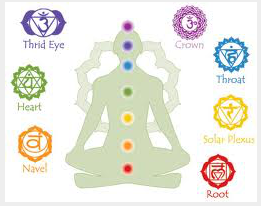 As a Christian I believe chakras are not real at all, they don’t exist! As I said before, this is a demonic doctrine. Isaiah 8:18 And when they say to you, “Seek those who are mediums and wizards, who whisper and mutter,” should not a people seek their God? Should they seek the dead on behalf of the living? The true purpose of chakra alignment is the channeling of demonic darkness into their being and the invitation of the Kundalini Serpent Spirit to freely enter their physical body. Participants seek to “awaken” the Kundalini using meditation, drugs, visualization, yoga or whatever means necessary, for a “higher” state of consciousness where they can become “god incarnate.” This is when they open up the “Third Eye”. Many people who practice this witchcraft say that when they reach this stage they see a bright light between their eyes. 2 Corinthians 11:13 For such are false apostles, deceitful workers, transforming themselves into apostles of Christ. 14 And no wonder! For Satan himself transforms himself into an angel of light. Satan’s deception is that with each successive chakra being “opened” the participant perceives a progressive shift in consciousness. The spiritual seeker now feels his clairvoyance and psychic telepathy with the demonic hierarchy getting stronger. As they continue, the participant eventually reaches a point of no return. In the final stage, loss of the ability to discriminate good from evil is severely impaired. 2 Thessalonians 2:9 The coming of the lawless one is according to the working of Satan, with all power, signs, and lying wonders, 10 and with all unrighteous deception among those who perish, because they did not receive the love of the truth, that they might be saved. 11 And for this reason God will send them strong delusion, that they should believe the lie, 12 that they all may be condemned who did not believe the truth but had pleasure in unrighteousness. Of course God always has the power to save, redeem, and deliver such a lost soul from the pit of darkness. This entry was posted in Occult and tagged Bible, chakra, Christianity, consciousness, crystals, Demons, energy, familiar spirits, healing, hinduism, Idolotry, Jesus, Kundalini, mantras, meditation, Occult, Satan, satanic doctrine, spirit guides, spirits, witchcraft, Yoga. Bookmark the permalink. Thank you for this insightful article. I know someone who worships ganesh, and this individual is demonized. Also, my life is in shambles, and I’d appreciate a prayer on my behalf. Thank you again.